Do You Need Specific Fly Rod for Bass? Fly fishing is a fun hobby for most anglers and mixed together with a tough sportfish like bass, it can produce some your best memories on the water. Bass fight aggressively and if you aren’t using the right equipment, will most likely break something, whether a line or a rod. Having a decent bass rod will ensure the safety of your catch and your equipment. The following review will go into detail on the unique features you should be looking for when shopping for a fly fishing rod for bass fishing. Yes, fishing for bass does require a fly rod with a particular set of features. Bass are tough sport fish that don’t give up without a fight. Here are a few reasons why you would need a rod explicitly built to catch bass. They are accurate: Bass love hiding in hard to reach spots that most rods just can’t access due to a lack of accuracy. They’re strong: Again, bass are known to hide in places with lots of weeds and brush, being able to pull them out with a specially designed fly rod makes it a lot easier and less stressful than using a standard rod which would most likely end up battered and bruised. Fly Rod Weight: A rod weight rating is an indication of what weight of line that should be used with that specific rod. In the case of bass fishing, the minimum line weight should be a rating of eight. It's important to find the right rod weight for the species of fish you are after. Fly Rod Length: Fly rods can vary in size and depending on the size have a wide range of uses for different settings. Smaller rods around six to eight feet are best used in small bodies of water like creeks which are known to have few obstacles. Larger rods around eight to ten feet work best in more open bodies of water. Fly Rod Action: Fly rods have three primary actions; fast, medium, and slow. Actions are terms used to describe how the rod bends. Fast action rods only bend at the very top of the rod, meaning they are very stiff and great for fishing for larger fish, due to having more power in the rod. Medium action rods bend at the halfway mark of the rod which means they aren’t as powerful but are best for beginners. They are a decent all-around rod in most circumstances. Small action rods bend all the way to the very handle. These rods are great for beginners and should be used in smaller bodies of water. Fly Rod Material: The material used in each rod is important. Knowing the limitations and strengths of each is crucial for being able to use them in the best possible way. Most fly fishing rods are made from either graphite or nano-silica resin. Bass fly fishing is a particular type of fishing that only works if you are willing to invest in a good quality rod built for that exact type of angling. The benefits of not holding back when it comes to prices are endless. One of the benefits is not having to worry about your rod breaking. If you go ahead and just use any old fly fishing rod and expect it to work as well, you are wrong. All of these specially made fly rods are built to last the pounding that a strong bass is going to give them. A bass fly rod allows you to fully take advantage of the species you are after. Having dedicated equipment like a fly rod will make catching this fish ten times easier, as well as more enjoyable. Below is a list of five different fly rods that will be given a detailed review of their features and abilities. Some are better than others depending on your intended use, but that’s for you to ultimately decide. The St. Croix Mojo Bass Fly Rod is a more basic bass fly rod. With a medium-fast action, it’s best used in medium-sized bodies of water with a good amount of accuracy for those hard to reach areas where we know bass love to hide. Made from SCII graphite, it’s lightweight and easy to use. The rod has three different weights to choose from. However, as we said before, for bass, a minimum rod length should be eight feet. The rod's length sits at 7 ft and 11 inches which makes this fly rod great for fishing bass in more open, small to medium-sized lakes. It has been designed for large wind-resistant flies but is easily used with smaller flies too. This fly rod is an excellent tool for anyone starting out fly fishing for bass. It is easy to carry and use, with pretty good accuracy, if used on a short-medium range. The rod has been designed to be well-balanced, which compliments the comfortable cork grip, making it easy to cast both large, wind-resistant flies and smaller flies. The rod even comes with a five-year warranty. This all-around decent product is excellent for anyone wanting to give bass fly fishing a try. ​This rod manufacturer has spoiled their customers with a vast choice of sizes, 14 to be exact. All the way from a three weight up to a ten weight. The medium-fast action abilities make this rod a robust and sturdy tool that is best suited in short-medium sized lakes. It’s a lightweight rod perfect for any fishing trip. Just like the previous product, this rod is made for beginners or fishermen with little experience fly fishing or even just with bass. A very sensitive rod that is also great for professional anglers, this allows you to know exactly, with pinpoint accuracy, when a fish is biting, making it easy for consistent success on the water. Built with anodized reel seats and braided carbon fiber inserts make this a pretty cool-looking fly rod. A lot of reviews of this rod mention how proud they are to show this off to any of their buddies. What makes it even more attractive to customers is the comfortable premium-quality cork grip. A good looking, high-quality rod for both beginners and pros. To be honest, this fly rod is a great tool for bass fly fishing and it was a struggle to find any negatives to write about this product. Due to the sensitive tip, the rod allows both beginners and professionals to enjoy the benefits of consistent success on the water. The well-thought-out design of the anodized steel reel seats and carbon fiber inserts make this rod great to show off to your buddies. The cork grip is comfortable and feels great because the rod is so well balanced. The only downside is that you will need to supply your own travel tube if you are going on long trips across the state. However, this isn’t too big of a deal. If you are interested in more travel friendly fly rods, check out our Tenkara buyers guide. This rod doesn’t come by itself. Buying the complete package gets you a few neat accessories. 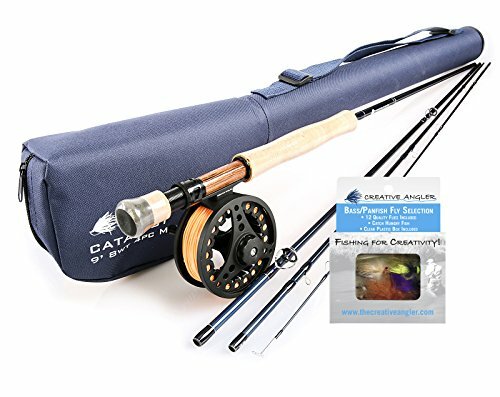 This purchase comes with a medium-fast carbon rod, built for short-medium distances, an aluminum fly reel, fly line, high-grade rod tube with a shoulder strap, and a waterproof fly box that fits perfectly into your rod tube outer pocket. The nine-foot, eight weight rod is an easy four-piece set up for an experienced angler that knows his way around a fly rod. The rod tube is made from a material called Cordura, which is known for its high quality, the fact that it comes with an accessories pouch, and that it fits your double-sided fly box perfectly. 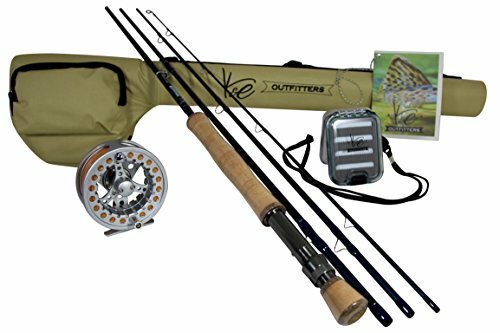 This package is perfect for someone who just wants to invest in some great gear to get out on the water as fast as possible. It comes with everything you need just to grab and go fishing. Although the four-piece rod isn’t easy to assemble and is more suited to experienced fly fishermen, it’s something every novice has to learn. As you are getting the benefit of a full package of fly fishing equipment, it's obvious this is an investment and is only for those who are really certain about taking this seriously. If you are just wanting to try out fly fishing for bass, you would probably be better suited to an individual rod and reel that you can experiment with. ​This fly rod is made with five layers of mixed carbon including a reinforced muscle carbon layer for up to 25% more strength which also makes it 15% lighter than its competitors. 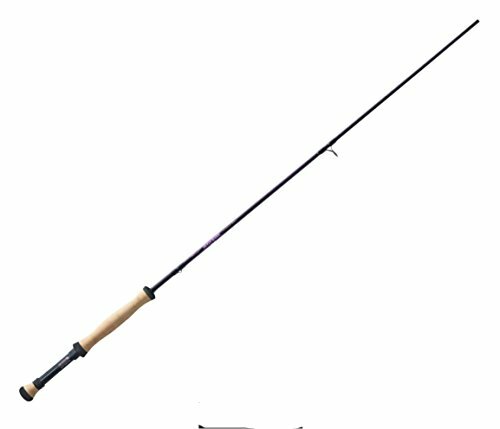 This rod comes in multiple weights from three up to 12, offering a good range for bass fly fishing, as well as fly fishing for any species. Just like the previous review, this rod comes with a rod transport tube made from Cordura, one of the best quality materials on the market. The medium-fast action abilities allow for a great fishing experience. The four-piece assembly is again more suited for experienced fly fishermen, but this is a skill every novice needs to learn. In the previous review, we said you should look into buying just a rod and reel for beginners who want to learn the craft of fly fishing for bass instead of investing in a full package, and this is probably the best rod to do that. It has excellent sensitivity for both beginners and pros to consistently bring in bass. This extra-strong carbon rod is a great way to introduce someone to the world of fly fishing. It has a wide range of weights with anything above eight being perfect for bass fly fishing. The Condura rod tube has four separate dividers for each piece of the rod and having to assemble the rod is something a beginner will have to learn one way or another, so this would be a great way to experiment. 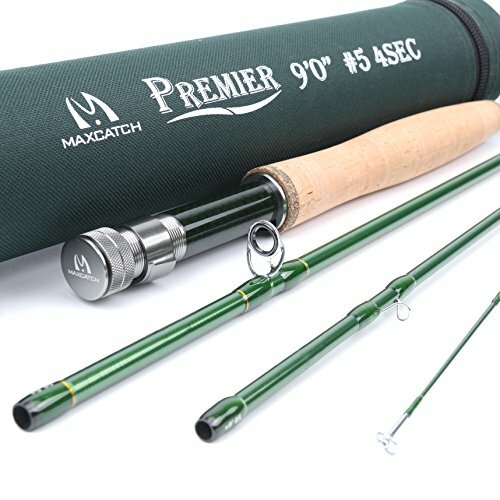 ​This fly rod is specially designed for fishing smallmouth bass. The 9ft, four-piece, carbon-made rod is excellent for fishing in small-medium bodies of water. With a durable eight weight reel, it is sure to be a strong opponent to any fighting bass trying to escape. This rod also comes with a 12 piece bass and panfish fly set. A great intermediate level fly rod that is easy to use and carry on any fishing trip. This rod is a basic, yet practical option for anyone that currently has fly fishing experience under their belt. This is an excellent tool if you really enjoy bass fishing, a tool that you can dedicate 100% to one species of fish and will give you consistent returns on the water. A basic tool that does the job when fly fishing for bass, there’s not much to say about this rod, other than it’s a decent tool for an experienced angler that wants to do some fly fishing for bass. Beginners would need to learn the assembly but other than that, it could even make a good starting point for someone looking to branch out into this method of fishing. It is purpose-built to fly fish bass and it does precisely that. Many features make a good bass fly rod, like the weight, length, and materials used. All of these things are essential elements that should never be overlooked. Some rods come with added bonuses like transport tubes or with reinforced carbon built into the rod. This review has provided you with the information, now all you have to do is decide which rod is the best for you.